Suzanne found yoga in Arizona in the late 1990s, where she had the good fortune to do work-trade with a large studio on the national circuit. This provided the opportunity to study many styles with master teachers (Vinyasa with Seane Corn, Thai Yoga Massage with Saul David Raye, Yoga Therapy with Judith Hanson Lasater, Astanga with Jonny Kest, Anusara with John Friend and more). In addition, she was in-studio with some of the greats (much love and respect to Dave Oliver, Jordan and Martin Kirk, Kat Meyers, Jeff Martens, Ian Lopatin, Dave Romanelli, Desirée Rumbaugh and all the great ones who have walked this path before us). 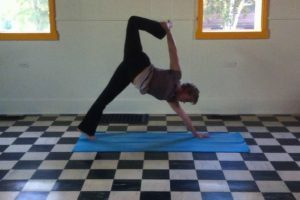 Suzanne is a 200-hour Yoga Alliance E-RYT. She started teaching in 2000, and is continually learning. A science nerd, writer, audiophile and simultaneously humble/ambitious novice gardener, Suzanne’s classes tie into the world around us, weaving together cutting-edge bio-mechanics and ancient philosophy. The intention is to create an experience of profound presence and compassionate empowerment. Fair warning: Sometimes during class there are jokes, and they aren’t always good. But each class has ample time for meditation and savasana, so it balances out. The hardest part of yoga is showing up. Come play.